Another founding fathers of Singapore had passed away. Dr Toh served as Singapore’s Deputy Prime Minister from 1965 to 1968. After which, he took on the role of Minister for Science and Technology for the next seven years. During this period, he also served as the Vice-Chancellor of the University of Singapore. He continued his service to Singapore from 1975 till 1981. Concurrently, Dr Toh was the Chairman of the People’s Action Party (PAP) from 1954 to 1981. When he was dropped from the Cabinet in 1981, much to his dismay, he continued to serve as a Member of Parliament (MP) until he officially retired from politics in 1988. According to the book’s Lee Lieutenants, Dr Toh’s name was floated twice as prime minister on two occasions when then PM Lee Kuan Yew offered to step down after the PAP lost the 1961 by-election in Anson and in 1964 after the racial riots. Dr Toh will be best remembered as the backbencher who dared to speak up against his party with good intentions, and one of the rare fews in PAP that dared to go against the party Whip. Among the issues he criticised were: the pace of its leadership renewal, the Medisave scheme, the “killer litter” law, graduate mothers and the elected presidency. PM Lee Hsien Loong remembers one of those occasions: The 1985 Budget debate, during which Dr Toh criticised the CPF contribution – then 50% of wages – as heavy deposition on employers. “As it turned out, Dr Toh was right. The economy soon went into a steep recession, and by the end of the year, the Government had concluded the CPF rates were too high and indeed needed to be cut.” recounted PM Lee in a condolence letter. “He was critical of policies … but never actively went out to campaign against the party. Whatever he said, even if they were critical comments, were actually meant, from his point of view, for the good of the country and the party.” – Former PM Goh Chok Tong Recalling Dr Toh as someone who was never afraid to challenge the Government’s position, even against then-Prime Minister Lee Kuan Yew. He also called for political openness and tolerance, greater press freedom and inculcating an awareness in politics among the younger generation. He pressed for political liberalisation in speeches in 1983 and 1984 as he thought Singapore’s political environment discourage thinking and dissent and that PAP should allow for different views. Many of his views still resonate with many Singaporeans today. 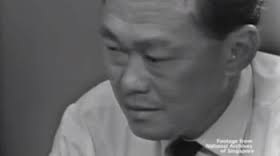 In 1965, Lee Kuan Yew cried when Singapore gained independence. But his deputy, Dr. Toh Chin Chye said he did not know why.